Bernie Sanders’ campaign manager lays out path to the nomination. Bernie Sanders’ campaign manager, Jeff Weaver, right, appeared with Steve Kornacki on MSNBC on Tuesday night. The Bernie Sanders campaign had been keeping silent following its loss to Hillary Clinton in New York on Tuesday night, a contest it really needed to win if it wanted eventually to catch up to Clinton in pledged delegates. Tough loss, don’t want to talk to the media: fine. 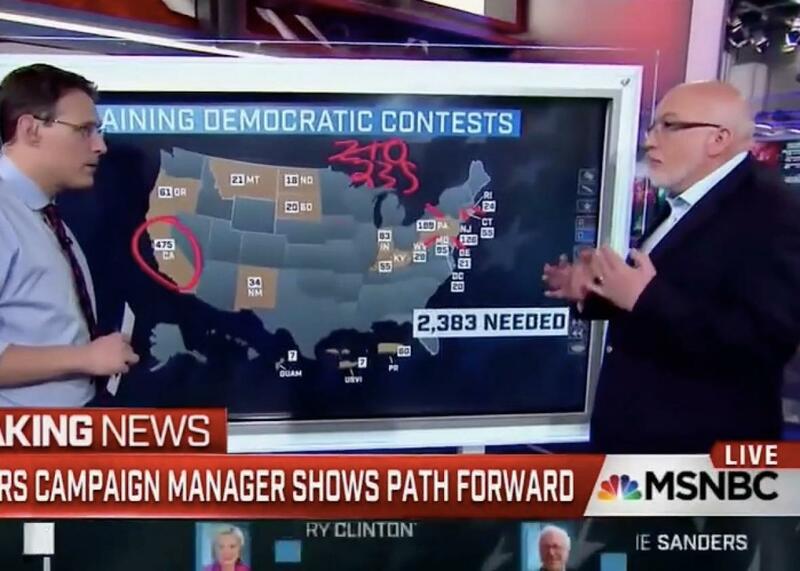 But then something unusual happened around 10:30 p.m. on MSNBC: Sanders’ own campaign manager, Jeff Weaver, appeared with network analyst Steve Kornacki and his interactive delegate map to explain Sanders’ path to the nomination. This was a bold move for Weaver, since Steve Kornacki is a smart person who was unlikely to let him spin without challenge. And a lot of spin, at this point, is necessary. Once it became clear that Weaver did not have a real explanation for how Sanders would surpass Clinton in pledged delegates, the conversation shifted to super delegates. And Weaver, as he’s said before, promised to fight to the convention in order to sway them. KORNACKI: Because you know as well as I do, if June 7 comes, and suppose Hillary Clinton has won the pledged delegate count and won the popular vote, there are going to be calls for you, the Sanders campaign, to make a decision to unite around her. You’re saying instead of that, you will spend those months, those weeks in the summer trying to flip superdelegates to Bernie Sanders before the convention? It’s hard to tell whether all this bluster from the Sanders campaign about fighting to flip superdelegates through the convention is serious, or just a way to motivate supporters to keep the faith. “At this point, yes, absolutely,” the Sanders campaign plans to take it to the convention. Maybe at a later point—say, once primary season is wrapped up on June 7—the campaign will have changed its mind.